Dogs use howling as one of their ways to communicate, and your West Highland White Terrier is no exception. But, there are several reasons why your Westie could be howling, and it’s important to find out what’s causing it. Your dog could be howling because they sense other dogs are in the area, or they could be anxious about you leaving the house. If you’re curious why your Westie could be howling, or if they’re howling excessively and you want to know possible reasons, read on. There isn’t a lot of solid research or concrete evidence to answer why dogs howl because it’s extremely hard to study it, especially if you’re trying to follow wild dogs. However, there are few things in the world that are more mesmerizing than listening to a dog howl. A howl is defined as a long and melodious sound, and most domesticated dogs lack the ability to truly howl. 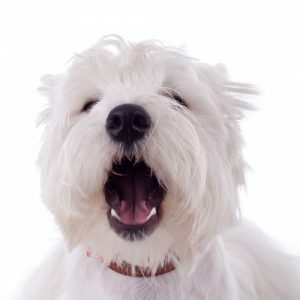 Your domesticated dog or Westie can make a baying noise or a short howling sound, and excessive howling is when they repeat this noise for an extended period of time. There are several reasons why dogs in general howl, and it’s important to rule out a medical issue or a serious problem. Your Westie can’t come right out and tell you if they’re not feeling well or if they’re injured, so the first thing you want to do is rule out any possible injuries or illnesses. The easiest way to do this is to schedule an appointment with your local veterinarian. When a dog feels pain, they tend to be more vocal or excessive in general, and this is your first clue that something can be medically wrong. Things like whining, yelping, growling, barking, or howling are good indicators that you want to schedule a vet appointment, just to be safe. Dogs can feel anxious just like people can, and this anxiety can intensify when you leave your dog alone when you go to work our out. If a neighbor or a family member tells you that your dog howls excessively when you leave them, it’s a good indicator of separation anxiety. Dogs get excited when they hear new sounds or they can get scared when they hear a loud noise or a new noise. This can lead to howling in response, and they may howl the entire time they hear the noise. A lot of dogs howl in response to sirens because they can hear a higher range of sounds, and they usually stop howling when the noise fades away or stops, so it’s not that big of a deal. However, if you live in an area that has a lot of these types of noises, the howling can easily get excessive. Your dog is a very smart animal, and they can quickly learn that howling or barking excessively can get your attention. It’s an easy way to tell you that they want something like toys, food, or attention. Your Westie may start to make loud noises or increase the volume of their barking and howling in an attempt to get your attention, especially if you ignore them at first. If you think this is what they’re doing, there are a few things you can do to correct this behavior. Once you’ve ruled out any medical issues, you can start to teach your dog that howling isn’t a good thing, and they’ll be rewarded for staying quiet. If you normally greet your dog with excitement or make a big deal when you leave home, the first thing you want to do is stop doing this. Don’t make a big deal with coming or going, and ignore your dog right when you get home until them calm down. It’s also a good idea to leave your dog with some clothing that you recently wore so they’ll have your scent around them when you’re not home. Never punish your dog for this behavior, and use positive reinforcement or ask your veterinarian for a mild calming product if the anxiety is more severe. Your dog may respond to noises they hear, and you can try desensitizing your dog by slowly introducing a quieter version of whatever noise they dislike. As your dog gets used to the quieter noise, you can slowly increase the noise level and repeat the process until they don’t howl or react to it. Attention-seeking behavior is slightly easier to deal with, and it starts by ignoring your dog when they start to howl or make excessive noise to get your attention. Turn away from them and don’t acknowledge them until they’re quiet, and reward them when they settle down. Your Westie is an important part of your family, and there are several reasons why they could be howling or making excessive noise. When you’ve ruled out any medical issues, you can check and see if your dog has separation anxiety or if they’re displaying attention-seeking behavior. When you’ve figured out the root cause of your dog howling, you can start addressing and treating the issue. Did you like the article? If you have anything to add or any tips or ideas why Westies howl you’d like to tell us about, leave us a comment below.